The Cyber-shot HX20V is sturdy and perfectly sized for a large pocket, yet it feels substantial in the hands. The body is made of plastic, but is nicely finished, and features a small yet effective textured grip on the front and also on the rear for the right thumb to provide a secure hold. The front of the camera is simple, but gives the impression of a more advanced model thanks to the lens surround and shaping of a small lens-release button in the corner. The buttons have been kept to a minimum on the back and top panels, with most operations accessed via the main menu. 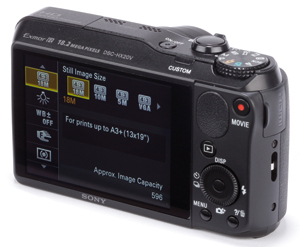 The one concession is the custom button, which can be assigned to exposure compensation, ISO or white balance control. This is logical, as only those straying beyond the iAuto modes will really need to access most of the settings. The screen is unchanged from the previous model, being a 3in, 921,000-dot LCD, and lacks any touchscreen or tilting functionality.